Fruit of the angels, that is, papaya benefits in the natural treatment of dyspepsia, constipation, burns, rashes, ringworm, bleeding piles, osteoarthritis, and it helps prevent atherosclerosis, heart disease, diabetes, and so on. Apart from the fruit, the leaves, seeds, and latex of this herbaceous plant also have therapeutic properties. Papaya fruit is usually yellow, greenish yellow or orange in color. It is sweet, musky, juicy and contains many black seeds that are also edible but bitter in taste. 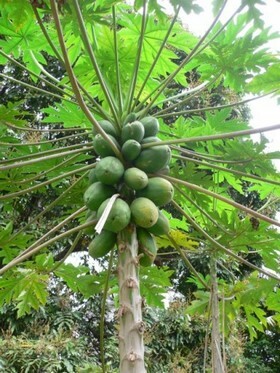 Papaya is indigenous to eastern Central America. Now, however, it is grown in all the tropical regions of the world. It is a pear-shaped fruit that belongs to the Caricaceae family. Papaya has antibiotic, antifungal, antimicrobial, anti-inflammatory, abortifacient, pugative, and diuretic properties. It protects against macular degeneration, colon, cancer, prostate cancer, breast cancer, and other similar conditions as it is rich in antioxidants and compounds like isothiocyanate. This fruit promotes digestion and relieves digestive problems like indigestion, bloating, constipation, and upset stomach. Papaya seeds help inhibit the growth of intestinal worms and parasites. They can be used for liver detoxification, too. Moreover, papaya benefits in improving the metabolism, boosting immunity and treating anemia. Being rich in fiber, it aids in weight loss when taken regularly for at least two to three months. It serves as a natural cure for inflammation of liver and spleen. Plus, papaya is useful in getting rid of urinary problems as well. In addition, regular consumption of papaya is valuable in preventing issues like diabetic heart disease, atherosclerosis, heart attack, etc. as it prevents cholesterol oxidation. Benefits of papaya leaves can be derived by heating them over fire and applying on the affected areas to heal muscle pain. It is believed that the leaf’s extract removes dead skin cells without causing any damage to the living cells. Consumption of papaya juice helps remove toxins from the body. Besides, papaya is helpful in providing relief from inflammation related to rheumatoid arthritis, osteoarthritis, asthma and gout. Coming to papaya home remedies for beauty care, this fruit is used in various face packs to make the skin soft and smooth. Furthermore, it reduces freckles and promotes skin lightening. It works as a great conditioner for hair as well. In terms of nutrition, papaya contains antioxidants, flavanoids, carotenoids, folic acid, vitamin A, vitamin C, vitamin E, iron, calcium, potassium, dietary fiber, and so on. It is low in sugar and sodium. It has high levels of lutein and zeaxanthin that help delay the development of cataracts and protect against chronic eye diseases. Besides, papaya has a powerful protein-digesting enzyme called papain. Scientists are studying the benefits of this enzyme for reducing side-effects of chemotherapy and radiation therapy like oral lesions. • Having half a papaya in breakfast relieves constipation. Regular consumption of this fruit can help cure piles. • Papaya benefits in relieving heartburn during pregnancy by eating a few pieces of papaya an hour before meals. You can take papaya tablets, too. • When dealing with diarrhea, prepare a concoction by boiling grated papaya in water for about 10 minutes. Stain and drink a cup this solution three times in a day. • Peel a ripe papaya and cut it into pieces. Soak these pieces in vinegar for about a week. Consume two tablespoons of this home medicine two times in a day as a natural treatment for spleen enlargement. 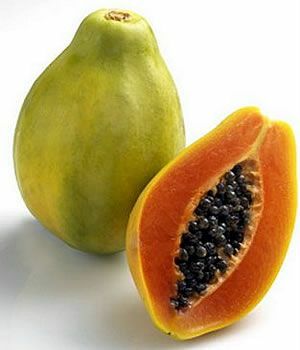 • Unripe papaya is helpful in getting rid of urinary problems. Besides, you can drink an infusion prepared from papaya leaves. • Dry some papaya seeds in the sun for a few days. Grind them and add a teaspoon of this powder in a cup of warm milk or water. You can also add some honey. Drink this solution in the morning to get rid of intestinal worms. • Application of papaya pulp as a poultice is useful in healing burns. Applying fresh papaya leaves poultice on sores and ulcers removes the offensive odor produced by the wounds. • Grind a few papaya leaves and add a tablespoon of honey in the paste. Taking half a teaspoon of this mixture along with water helps in the treatment of Jaundice. • Regular consumption of papaya juice helps reduce lung inflammation associated with smoking, whether active or passive. 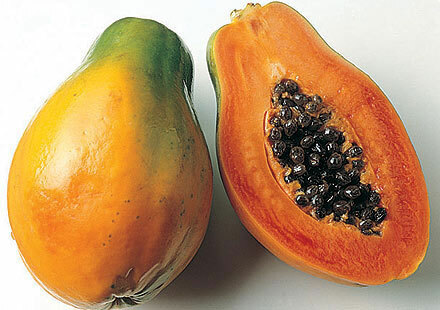 • When dealing with throat disorders like inflamed tonsils, drink the juice of unripe papaya mixed with honey. It is considered good for lymphatic system. • You can use papaya for hair care and conditioning. For this, you need to prepare a mixture by adding a teaspoon of honey and some olive oil in pureed half papaya. Blend this mixture and apply it on damp hair for some time. Finally, rinse it out and shampoo your hair. Besides, you can crush tender papaya leaves in water and use this solution as an effective hair conditioner. • Benefits of papaya can also be derived by eating about 250 g of ripe papaya daily in the morning on an empty stomach. Follow this therapy for at least one month to lower blood pressure. • Simply applying mashed papaya on skin for 15-20 minutes makes the skin soft. Moreover, the milky juice of an unripe papaya can help cure acne naturally over a period of time. • Another papaya home remedy for skin care to remove flaky skin involves using a combination of three tablespoon of mashed papaya, a tablespoon of honey and one-third cup of oatmeal. Apply this homemade face mask for about 10 minutes and then wash it off with warm water. • Take a quarter part of a papaya, blend the pulp in a blender, and add four teaspoons of green clay and one and a half teaspoons of aloe vera gel in it. Apply this mixture on face and rinse it off after 15-20 minutes to get clear skin. This papaya face pack for skin lightening is suitable for normal to oily skin. Here’s a video showing how to do papaya and strawberry home facial treatment. • In case you have dry and sensitive skin, prepare a face mask by mixing half a teaspoon each of raw milk, rose water and honey in half a cup of mashed papaya. Leave the mixture on skin for about 15 minutes and then rinse it off with warm water. • Another benefit of papaya is that it induces menstruation. 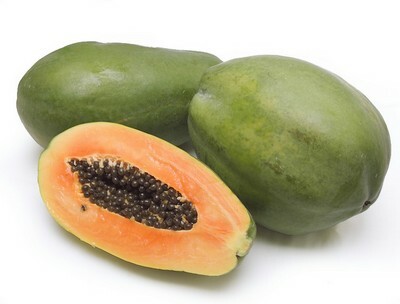 Basically, unripe papaya helps in contraction of uterine walls. • Application of papaya leaf juice heals ringworm. Leaving the fresh milky juice of papaya on skin for about half an hour reduces freckles and blemishes. Papaya can be eaten as a fruit, and added in salads, smoothies, and breakfast cereals as well. Moreover, you can add unripe papaya in stews and soups. In certain areas, papaya seeds are grinded and used as a substitute for black pepper as they have a peppery taste. Individuals suffering from latex allergies may be allergic to papaya because it includes a substance called chitinase. Pregnant women should avoid consuming unripe papaya as the latex substance may trigger uterus contractions. Although papaya benefits in preventing and healing several diseases, avoid eating this fruit in excess as it can cause stomach pain, diarrhea, and ulcers in the esophagus. Moreover, excessive consumption of papaya may cause yellowing of skin and palms, temporarily. u r doing a great work in this globe. i think, this is only due full of knowledge with commitments. THE INFORMATION ABOUT PAPAYA IS WONDERFUL. I SHALL OUT SOME HOME REMEDIES. I am glad I have read this. But please respond to this question of mine through my email before I die of worms infestation. Can the leaves of papaya also cure worms? if yes how do I prepare it. I have been to hospital many times but no avail but I am sure that my problem is worm infestation. I fit so much into the symptoms of worm infestation and I am now even afraid of using dewormer. Now saw your post• Dry some papaya seeds in the sun for a few days. Grind them and add a teaspoon of this powder in a cup of warm milk or water. You can also add some honey. Drink this solution in the morning to get rid of intestinal worms. Iam very grateful to have read this wonderful information.I will continue using papaya product because i have realized that it has medicinal benefit.